The atmosphere on this charming ship is comfortable- wherever you go on it. Being in the elegantly furnished cabins, the spacious panorama restaurant or the saloon full of atmosphere, on board our MS KATHARINA VON BORA you will feel at home from the first instance. Delicacies and lively dance music await you in the evenings. The sun deck is a favoured meeting point during the daytime. 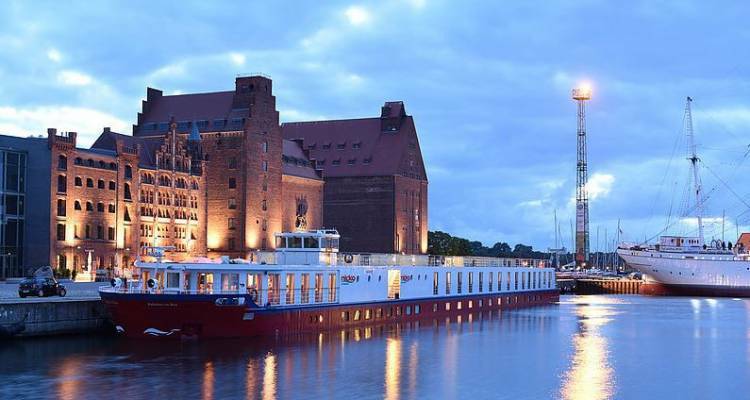 From here, you can also enjoy the landscape of the rivers Oder and Elbe passing by in style in pleasant company. All cabins are outer cabins and are furnished in style. All cabins on the upper deck are equipped with large floor to ceiling panorama windows that can be opened (French balcony). The windows in the main deck cabins cannot be opened. The deluxe cabins are furnished with a double bed (1.50 m x 2.00 m) with two mattresses. The 1 bed cabins are equipped with a fixed bed. All cabins are equipped with an air conditioning system that can be regulated separately, shower/WC, hair dryer, music channel, SAT TV, safe, minibar and telephone. The stylish panorama restaurant offers sufficient space for all guests. Let yourself be pampered by the friendly staff. The on-board kitchen offers tasty international and German dishes that are presented with passion.